This month’s bardic profile is of Bugga Bilibit, a performer whom I have come to know and greatly esteem over the past couple of years. What’s your full SCA name? Bugga Bilibit æt Elediche. My camp has a sub-group dedicated to Anglo Saxon studies, ‘Bugga’ was the name of several abbesses in period, and ‘bilibit’ is a word made up by the Anglo Saxon monk, Aldhelm, it means ‘the sound of wine pouring’. ‘Elediche’ is the name of one of our camp’s ‘villages of legend’. What attracted you to the bardic arts? I’ve been a singer my whole life, and a musician. I joined the SCA because I was inspired by hearing the choir perform at a Newcomer’s meeting, though my family had already been going to Pennsic for about eight years at that point. How long have you considered yourself a bard? 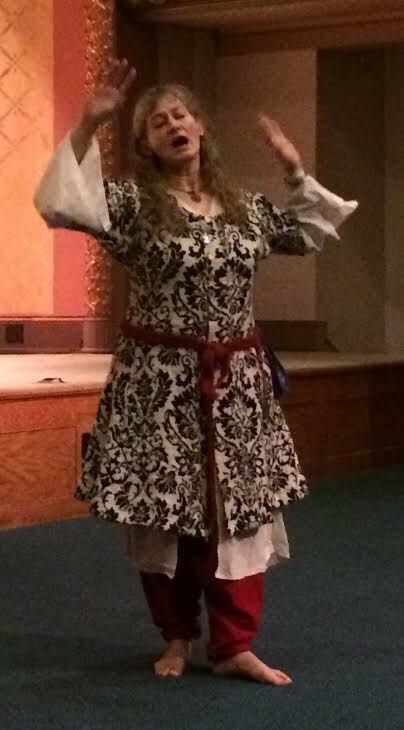 I think of myself as more of a minstrel, and beginning the process of choosing to see myself as a performer of any real sort in the SCA probably really started when I won my first Barony Bardic competition a few years ago. What’s your primary form? Do you play any instruments, and if so, which? I am primarily a singer, though I also play mandolin and guitar, a little recorder. I’d like to be doing more with those. Ask me when you see me! I’ll sing on the spot. What sorts of pieces do you enjoy producing? What attracts you to that style? I am passionately in love with period music, the earlier the better. I love singing in other languages, I love singing with others in weird and beautiful harmonies. Describe a favorite performance of your own in the SCA. What makes it a highlight for you? During the Kingdom for a Stage event last year I started off one performance playing, badly, ‘Gaudete’ on my recorder. I could feel the wincing from the audience, but then I broke into a filk of ‘Gaudete’, ‘Cows Say Hey’, written by my campmate Lichang. It got a good laugh. Unexpected incongruous things please my sense of humor very much. Also in this category: teaching my Barony to sing a Latin drinking song at a meeting, and singing with three of the Kingdom’s top Bards processing it with Æthelmarc at Pennsic opening ceremonies. Describe a performance by someone else that inspired you in the bardic arts. How did that performance guide you to improve your own art? What did it prompt you to do? I am continually inspired by Aneleda Falconbridge (ed. note: Analeda just received a writ to be elevated to the Laurel in the East). Her songs and performances are so joyous and unpretentious. I heard her speak at one point about writing songs that others could sing and be inspired by, and I love her way of viewing a portion of her own art as having the goal of sing along. I think ‘I Am of the North’ is perhaps my favorite of hers, though I also heard her doing a contrafait based on John Dowland about life as a parent at Birka last year that I loved. You can find it here. I’m again teaching a class on singing in other languages, because I think it’s easier and way more fun than most people think. The feel of another language in your mouth in a song is like a postcard from far away; it opens up new stuff. But my big obsession is the Pilgrimage Project. When I became Barony Bard I chose to use that award as an excuse to learn as much as I could about monophonic period music. I found the collections of pilgrimage songs to be such beautifully rich resources, particularly the Cantigas de Santa Maria, which are endless and so sing-able. I thought that Pennsic would be the perfect place to ‘go on pilgrimage’ and sing these songs. And it is! This year will be our third, and I’m trying to broaden the circle of invitation every year, this year by having a class during Peace Week to practice the songs. Meanwhile we practice them in my Barony most weekends leading up to Pennsic, drawing not only on the Cantigas but also heavily on the Llibre Vermell de Montserrat. It’s a whole different, magical experience to be banging along with our staves, pilgrim hats on, as we walk on the Serengeti singing at Pennsic. Who are some of your favorite influences, either for your own research and composition, or for performing within the SCA? I love the recordings that Philip Pickett and Istanpitta have made. I am eternally grateful to Al Cofrin’s books of music, available through the Istanpitta site; they are an amazing treasure that he created based on research done while he was doing graduate studies. I’m so glad that he chose to publish and share it with all of us. What other types of performance do you particularly love to see / hear? My tastes are fairly eclectic, I like all sorts of genres of performance. But I will admit to a slight preference for the singer who includes a sing along in their repetoire. What advice do you have for someone who wants to be a bard? Follow your passion. Start with what you love to do and learn to do it even better. Then see what avenues of discovery open off that beginning. Also: commit entirely to what you are doing, 100%. And breathe. Still learning from my own advice. Thanks for doing this, Gwen! You are inspirational!